A west Wales environmental campaigner is to travel the length of Britain to promote vegetable oil as an alternative to diesel. To prove the substitute fuel works without affecting the performance of his car, Daniel Blackburn is driving from Land's End to John O'Groats. Last year Dyfed-Powys Police officers impounded a number of cars in the Llanelli area for using vegetable oil as the drivers had not paid duty on it. But Mr Blackburn, from Bwlchygroes in Pembrokeshire, said as long as Customs and Excise is informed and duty is paid on the oil then motorists can save money and help safeguard the environment. Last year the forestry worker paid £550 for a conversion kit from a German company which he installed on his Citroen ZX 1.9 diesel turbo himself. Each month he tells the authorities how much vegetable oil he has used and estimates it costs him about 73p a litre - which is cheaper than diesel and perfectly legal. He even runs his own website to encourage others to follow his example. "The idea of the journey is to promote vegetable oil as a motoring option as it is more environmentally friendly than diesel because it is virtually carbon neutral," he said. He said the arrests in Llanelli last year had detracted from the positive case for vegetable oil as a fuel and most people now thought it was illegal. Around 5,000 cars in Germany are run on cooking oil and farmers in Ireland are also converting their machinery. But Mr Blackburn said just a handful of people in Wales were using it. The 32-year-old said he became conscious of the need to use more environmentally-friendly fuel while working in the Philippines on a project to persuade farmers not to slash and burn the tropical forests. He said he felt uncomfortable telling them they were contributing to the "greenhouse effect" when most of the damage was done by the burning of fossil fuels in the west. Mr Blackburn leaves Wales this week to attend an environmental festival. He then continues to Land's End, where he begins his two-week journey. On the way he is staying with friends and fuelling his car with vegetable oil bought from supermarkets. 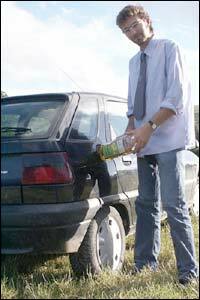 Customs and Excise say the duty on vegetable oil as a fuel is 25.82p per litre, 20p less than ultra-low sulphur diesel. It is no illegal but the motorist must get permission from officers before they start using the replacement fuel and keep an accurate record of the amount used.